Tis’ the season for sick days…which means way more screen time than usual. The little man came home from school feeling super exhausted Wednesday night and sure enough on Thursday AM woke up with a fever, runny nose and glassy eyes. I quickly set up his “couch quarantine” and stocked up on new art projects, library books and flipped on PBS Kids (our usual sick day jam). 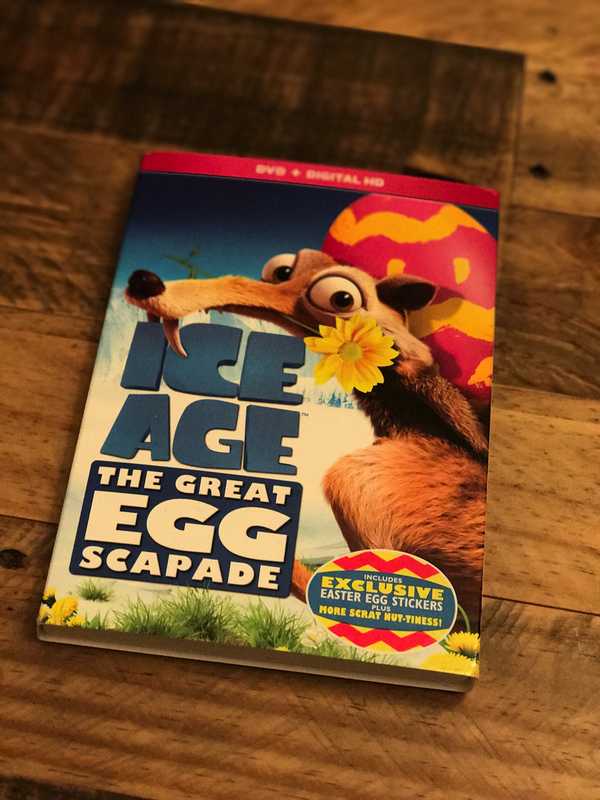 I was glad for a Thomas reprieve when the new ICE AGE: The Great Egg-scapade DVD arrived in the mail from Fox Home Entertainment for us to check out. I love when tv is educational, but I also love when it is entertaining for both the kiddos and myself. This little spring inspired episode of the Ice Age family is cute and funny. This DVD comes out on Tuesday, March 7th and is available as a DVD and HD Digital Download. Check out the press release below for more info on the DVD and enter my GIVEAWAY for your very own copy! Scrat, Manny, Sid, Diego and the rest of your prehistoric pals from Ice Age are back in an all-new hilarious animated adventure! Business is booming at Sid’s new egg-sitting service but when the dastardly private bunny Squint steals the eggs, Manny, Diego and the rest of the gang take off on a daring rescue mission that turns into the world’s first egg hunt. Enjoy even more nut-tiness with tons of Scrat extras! The original herd Ray Romano, John Leguizamo, Denis Leary, Seann William Scott, Josh Peck, Keke Palmer and Queen Latifah are back. Featured guest voices include Taraji P. Henson, Seth Green, Wendy Williams, Gabriel Iglesias, Lili Estefan and Blake Anderson.